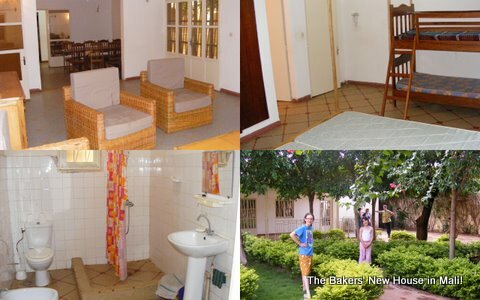 (TL: The lounge and dining room, TR: The master bedroom, BL: The bathroom, BR: The front garden). 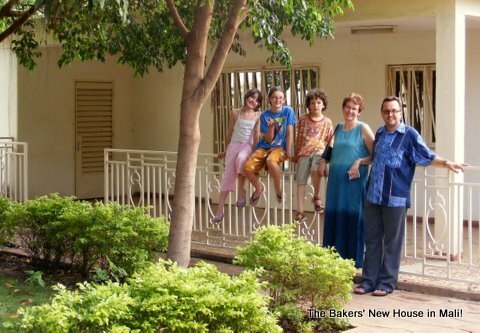 The journey here was mostly uneventful, though the turbulance experienced in trying to land in Bamako during a thunder storm was something I’d rather forget! Having two relatively short flights with Royal Air Maroc (just over 3 hours each) and a pleasant stop-over in Casablanca made for a relatively stress-free journey, even if the meals on the second flight were identical to those on the first, and were served at around 2:00am (I mean, who wants to hear that timeless airline mantra of: “Chicken or beef, sir?” at that time of night??) 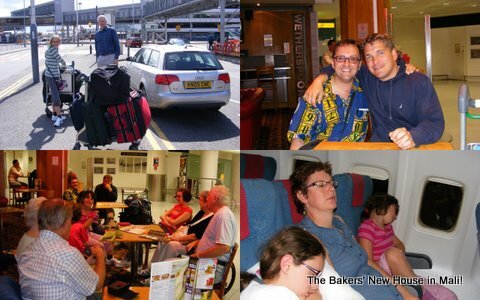 Here are some photos of our journey here: Arriving at Heathrow, saying goodbye to friends and family and having a nap on the plane before the turbulance woke us up. 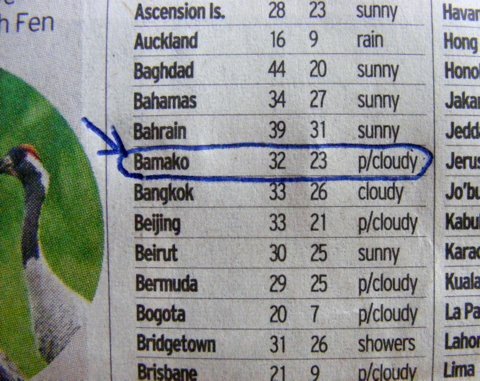 Reading through the Daily Telegraph the other day, I was rather supprised to find Bamako, capital of Mali, listed in the world weather! 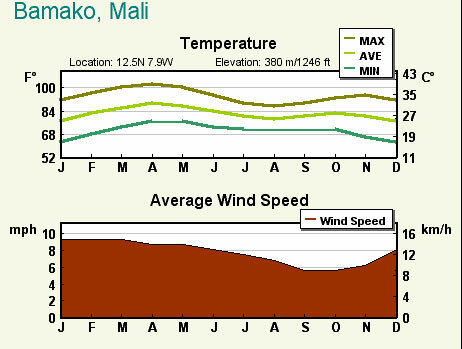 Most of all, I’m looking forward to December and January, when (due to the Harmattan) night-time temperatures can fall to as low as 10 degrees at night, almost 15 cooler than Cotonou ever saw! Remember this post, when I found a TESCO shirt for sale in Cotonou, Benin? Well, it’s clearly a West African shirt, and I should know as I own dozens of them (have a look at the Rob’s Shirts album to see more). How it found its way to central England, I may never know, but it’s a very nice shirt and, at Â£4.50, is almost as cheap as buying one in Benin! What are your favourite words??? Being an international, polyglot (ooh, there’s another one!) sort of person, I have favourite words in other languages too! There you go! 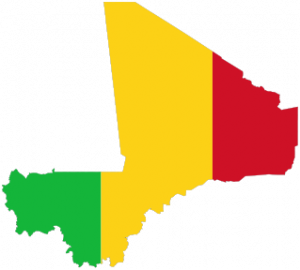 At the moment, I’m learning Bambara, the language widely spoken in southern Mali. For now, I only have one favourite word in Bambara, which is: bamanankankalannaw, which means ‘students of Bambara’, of which I am one! Thanks for reading – what are your favourite words? Leave a comment and let me know! 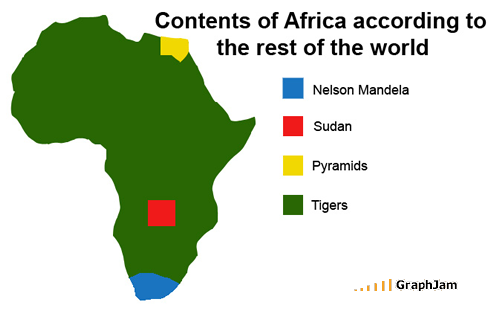 (ii) That many maps of the world have got the projection all wrong and make the HUGE continent of Africa look almost the same size as Greenland. 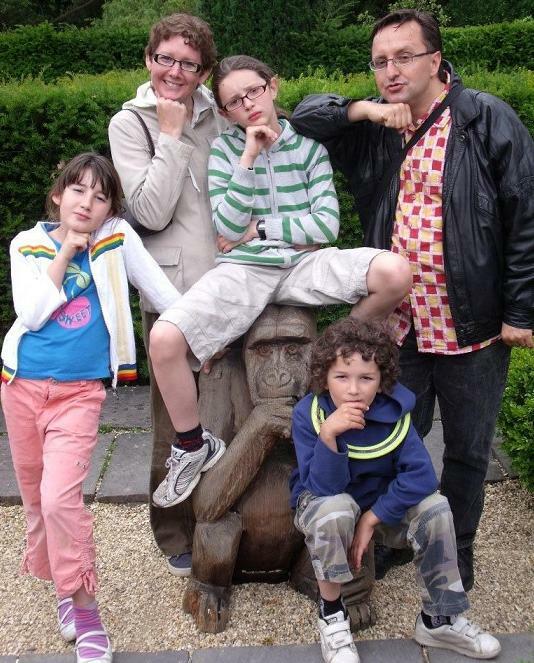 Hard to tell with our three ‘cheeky monkeys’ in the picture!